***PLEASE NOTE THAT ALL SHIPPING EXPENSES MUST BE PAID IN FULL TWO WEEKS IN ADVANCE OF YOUR PUPPY'S DATE OF TRAVEL, IF YOU PLAN TO HAVE IT SHIPPED TO YOU VIA AIR TRAVEL OR GROUND TRANSPORT SERVICES. THIS CHANGE IN POLICY HAS BEEN MADE DUE TO CLIENTS WHO HAVE NOT FOLLOWED THROUGH WITH THEIR OBLIGATIONS. We also require a 50%down deposit to reserve your choice of puppy, and also payments must be received and clear the bank before you you receive registration paperwork. * We no longer are offering co-ownership on breedingstock with the exception of existing client relationships with local breeders, is again is due to problems with long distance clients not meeting their obligations. KACY AND COWBOY....OUR FOUNDING PAIR... GRANDPARENTS/GREAT GRANDPARENTS TO OUR CURRENT LITTERS. Josie is the smaller of Spice Girl's two daughters. She is marked similarly to Mom with brown eyes an white markings on both front paws. She has a sweet and calm disposition and is expected to be petite like her father, approximately 10 to 11.5 inches tall when grown. She has also inherited her side's exceedingly luxurious and fluffy coat. Josie will be a good candidate for a showing and brood female and is going to be a show type dog. Elsa is slightly taller than her sister with a light blue coat, medium amount of white marking and lighter copper than her mother. She has a blue eye and a brown eye and their side carries for blue-eye tri-color. At her current stage of development, she seems to be a more rangy "ranch style" female than her litter sister Josie. Elsa is expected to be 11.5 to 13.5 inches tall when grown. She is also quite fluffy in coat, but it may be a bit shorter in length like mom's. On co-ownership with Natalie Head in Washington State. This litter is sold as pets and working dogs only. Ginger is a ginger-furred red merge female with one blue eye and one green eye. She is very pretty and very sweet and adores people. 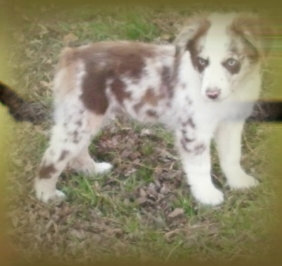 She will be a small to mid-sized miniature Aussie female. Minnie is a minimally marked black tri-color female. Sold to Lloyd Anderson in Minnesota. Jesse is a minimally marked red tri-color female with hazel eyes. She will be a small miniature female, about 14 or 14.5 inches tall at maturity. Jed is a gorgeous sandy light red merle toy male with amber eyes (one of which has a small blue spot in it.) He is a petite little boy whom we expect will take after his paternal grandfather in size... Grizz was a 10 inch tall male. Jed may easily stay under the 12 tall zone. All these puppies are breed for excellent temperament and raised with children. *If you are looking for a service dog for developmental disabilities, health issue alerting or a disabled active-duty or retired military veteran please call us. Our service animals are provided on an income-based donation basis as is affordable to the animal's future service partner as a Christian Ministry to special needs families and in appreciation to our U.S. military service members.